• PLOT SUMMARY: "Shock And Awesome" It's the newest chapter in the legacy of a long-time DC icon from writer Frank Marraffino (The Dark Goodbye) and artist Henry Flint (OMEGA MEN). The Haunted Tank is back in action, but this time it's an M1 Abrams in modern-day Iraq! 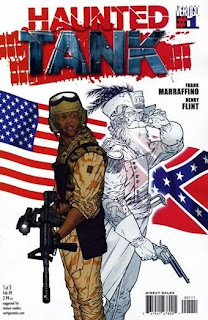 African American tank commander Jamal Stuart has his 21st century war ride in full battle rattle and is ready for anything – anything except the whistling-Dixie combat guru ghost who shows up uninvited! Of course, this isn't the first time the spirit of Confederate Civil War General J.E.B. Stuart has helped guide a tank. In times of war he makes himself available to assist his descendants in battle. Jamal Stuart, meet your forefather!